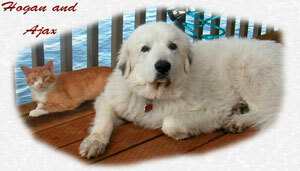 Our 5 year old, 102 pound Great Pyrenees, Ajax, has just not been the same since our old dog died a year ago. We knew he'd miss her, but his entire behavior and demeanor changed. He'd swing from being the usual independent Pyrenees profile to being clingy and needy within a day sometimes. Ajax really seemed lost without his mentor. We agonized about getting him a puppy but we weren't convinced that he would be a good role model in his current state. 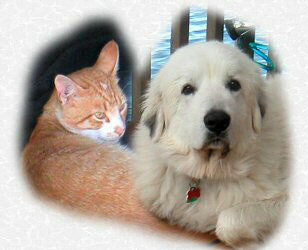 We'd heard from the time we picked out Ajax that Great Pyrenees have an odd trait: they love cats. We certainly hadn't noticed it on walks when he'd try to chase every cat that would cross his path, but our cats and dogs in the past have always tolerated each other well. 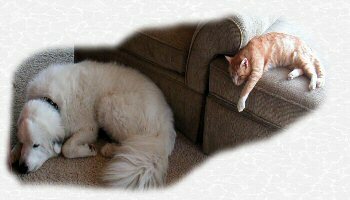 I called Feline Friends one morning asking that they keep an eye out for a cat who didn't just tolerate dogs, but actually seemed to LIKE dogs. I was thinking it might take months to locate a buddy like that for Ajax, but Jo called me back that afternoon with the news that she had just such a cat ready for adoption that day. 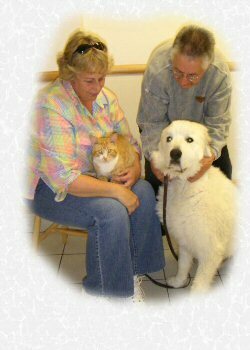 I was pretty sure that was impossible, but we agreed to have the critters meet at Steamboat Animal Hospital and see how they interacted. Ajax, being no dummy, knew he was at "the dreaded vets" and was too focused on getting out of there before they could come at him with that rectal thermometer to really interact much with the cat who was wandering under him and rubbing through his legs, but we agreed to adopt this friendly cat named Hogan anyway. Hogan has been the answer to our prayers, and Ajax's! There never seemed to be an adjustment at all. During the hot weather that followed Hogie's moving in, we would go down to our deck under a giant maple tree every evening to cool off. Hogie and Jaxie would lay side by side to survey their domain. Ajax also has his own little deck that overlooks the water where he likes to lay in the mornings and late evenings and we now find both of them snoozing there. ears poke up from behind another plant next to the bush. The snooze buddies were taking a break together from the rigors of guard duty! Due to the large numbers of nocturnal predators in our area, they both sleep inside the house at night. When we get up in the morning, there's Ajax dozing in front of the door and Hogie curled up but purring only a couple feet away. We all want to thank Jo for pairing these two up. Hogan is so affectionate to all of us and has become a very important part of Ajax's life! Over the years nearly all our pets have been rescued and some have been badly abused before coming to live with us. We have seen over and over how much love they have to give in spite of or perhaps because of their previous tough lives.